BlackBerry Internet Service 4.1 coming in September? | BlackBerry Blast! BlackBerry Blast! > News > BlackBerry Internet Service 4.1 coming in September? BlackBerry Internet Service 4.1 coming in September? BlackBerry Internet Service 4.1 is due in September, if N4BB is correct. They got their hands on some leaked documents and are reporting an upgrade to BIS that lists multiple improvements. The new version will supposedly be released along with OS 7. BIS 4.1 won't hit the US until October, but will be released abroad in September. "According to the slides, BIS 4.1 will be rolling out to Asia Pacific � September 10th, Europe � September 23rd, and North America � October 8th. 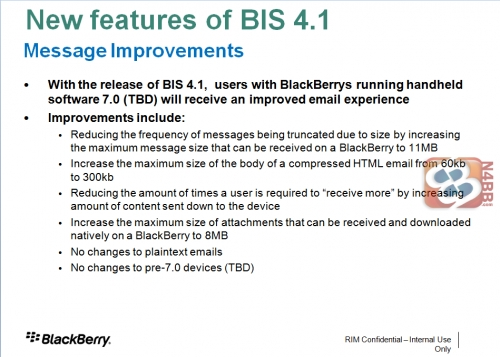 BIS 4.1 feature enhancements include: improved email experience, inbox priming, account management updates (Security Wipe Email Control and SIM Swap Experience), QQ and 139.com email integration, carrier reporting, UI changes, and language support for Latvian and Lithuanian. " With so much bad news coming out for RIM lately it's nice to see they are still working at improving the BlackBerry experience.